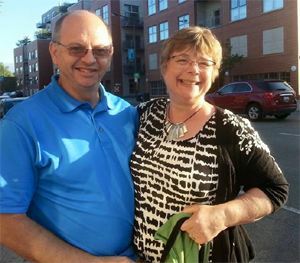 Troy and Karen Thiel head to Seattle! A fond farewell to Troy Thiel, one of our leaders in Willy Wash: A Musical Yahara. He’ll be moving to Seattle in June. Come back and visit us once in a while! University Club: Did you know that the University Club in the Library Mall at the end of state street serves breakfast and lunch to the public Monday through Friday? It’s really good fare and reasonably priced, and even better, they carry Rökker Vodka. Anyone up for brunch and bloodies? uclub.wisc.edu. Summer Intern: I would like to welcome aboard Quasia Thomas who will interning for Maximum Ink this summer in the web dev department! Adventures with Lizzie: Happy Sweet 17 to Lizzie who had her birthday last month! May was also a month to prepare for junior prom. Shopping, sizing, seamstress (thanx Rebbeca Nebula), hairdo. 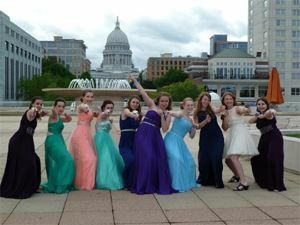 It was a big to do and all the girls showed up for a photo shoot on top of the Monona Terrace on a day when the wind and chilly weather seemed like it would not give in. But the girls toughed it out and after the shoot, all went to Porta Bella for dinner, followed by dancing at the Overture Center. Now it’s back to Poms tryouts all week for new members and then school’s over. Nikko is only an inch shorter than me and getting very tall, seems like he shot up a foot in the last 6 months! Summer camp is around the corner, Nick and Nikko will be camp buddies once more! Been listening to a lot of Rush and Zeppelin, Nikko is digging Bonham and Peart.